I love receiving homemade gifts and I enjoy giving them even more. Lots of love and caring goes into a gift that someone has taken the time to plan and make just for you. Many of the gifts that we give are home canned with fruit and vegetables from our garden. And really who wouldn't just love a fresh pie, or a nice basket of cookies. These are some of the homemade gifts that will be coming from my kitchen this year for family and friends. I have a little Hot Chocolate and Christmas Tea Bar set up on the Lazy Susan so grab a cup of Hot Chocolate or Christmas Tea and enjoy the gifts! I hope you will have the time to enjoy giving gifts from your heart and your hands making such loving memories. Thanks so much for stopping by today and hope that you will come back to see us real soon! I would love to be on your gift list! Food gifts are the best! I bet whoever is on your list is thrilled! Thanks for sharing these yummy ideas with us at #FoodieFriDIY! Spicy Butternut Bread?!?!?! Going to check that out, RIGHT NOWWWWWW!! Can you just adopt me, Miz Helen? That red velvet pie looks incredible!! Thanks for sharing at #FoodandFitnessFriday! 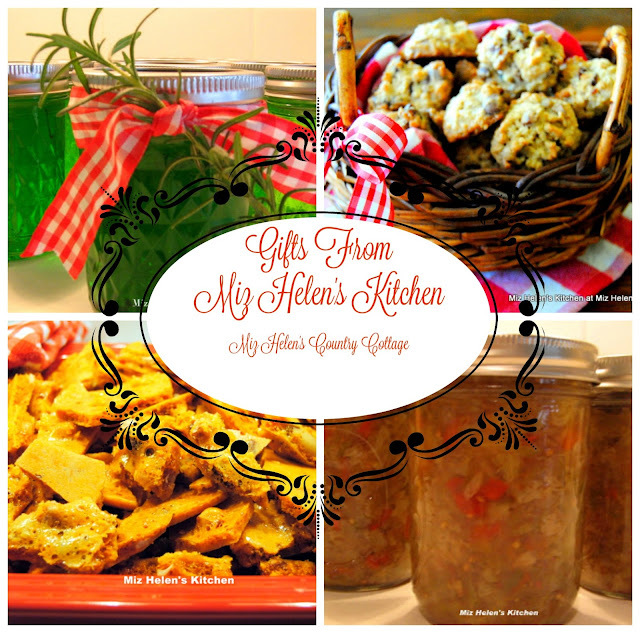 Oh, Miz Helen, what wonderful gifts! Everything looks so delicious, from the preserves to the Nutty Brittle and your wonderful pies! Sharing and featuring this post at next week's Hearth and Soul Hop. Thank you so much for being a part of the Hearth and Soul Hop. I hope you are enjoying the holiday season!